WASHINGTON — State departments of transportation could improve the movement of freight along their highways by establishing a rapport with motor carriers and companies that need goods to be moved, according to Utah Department of Transportation Director Carlos Braceras. Braceras, who regularly meets with fleets and shippers, said that freight companies’ requests of his department are usually relatively small, such as the addition of a climbing lane. Utah contains important freight routes, particularly Interstates 15, 70 and 80. Braceras said that 20% of interstate traffic in Utah is made up of heavy commercial vehicles. In addition to meeting with company executives, UDOT also has engaged with truck drivers. The agency has a semi-truck that it takes to driving schools so department officials can meet with new recipients of commercial driver licenses to help them learn about and manage where blind spots are on the vehicle. Statewide plans to improve transportation networks can also extend beyond trucking. Charles Zelle, commissioner of Minnesota DOT, said his agency works with representatives from rail groups, deepwater ports and the state’s 135 airports. MnDOT is in the process of conducting freight-centric projects that involve synchronized traffic lights and left-turn lanes. The agency is also testing synchronized signals on a county road in Minneapolis. Zelle stressed the importance of technology and thoughtful planning for projects in both large cities like Minneapolis and small cities like Redwood Falls, which is about 115 miles west of the Twin Cities and had a population of 5,254 as of the 2010 census. We’re looking to see how we can advance the whole idea of truck platooning. We want to be a place where companies feel they can come. Modernizing transportation systems often involves automating vehicles in addition to infrastructure. UDOT has conducted truck platooning demonstrations on a stretch of I-80 west of Salt Lake City to study the fuel economy savings the trucks could yield. 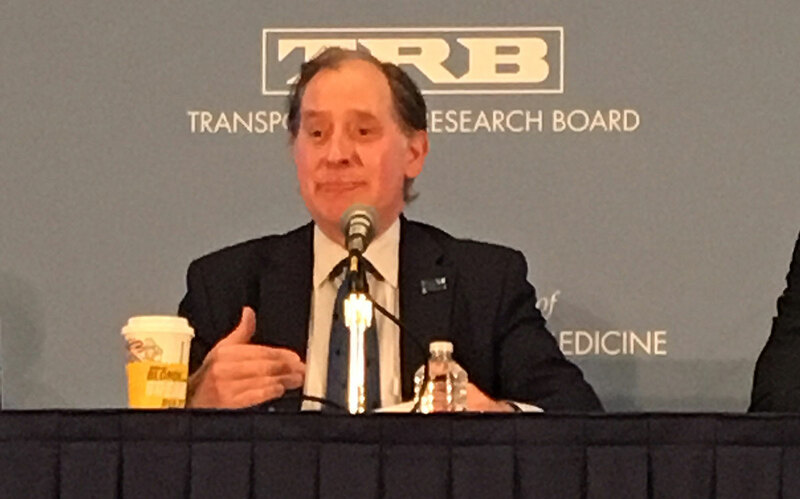 He said connected vehicle technology, such as platooning capabilities, will probably manifest sooner in trucks than personal vehicles. Braceras said fleets will shoulder additional responsibility in the transition to autonomous technology because the companies, not the individual drivers, will be the ones who need to make sure all systems are properly updated. He said UDOT’s first platooning demonstration was the result of a partnership with an interested company and that the agency has since been approached by a second firm to conduct similar tests. “We’re looking to see how we can advance the whole idea of truck platooning,” Braceras said. “We want to be a place where companies feel they can come.